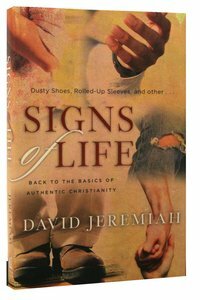 With our society's sometimes unfavorable view of Christians, it is all the more important that believers display what Dr. David Jeremiah calls signs of life ? signs that Jesus has transformed us and that we are committed to Him and His kingdom. They are signs that ought to be detected from across the street, over the fence, down the hall, throughout the office, or in the pews, for it's not enough to just talk about Jesus. It's also not enough to serve Him in secret with our acts of private devotion. We have to display the lifestyle of the Nazarene in the midst of a corrupt and darkened culture. In a world starved for love, joy, peace, patience, kindness, faithfulness, honesty, relevance, and compassion, Christians should specialize in exactly those things through public expressions of private faith. It's by our smile, our compassion in the face of misfortune, our friendliness, our simple lifestyle, our willingness to commit random acts of kindness, our social ministries, our tears, and our words that unbelievers recognize Who we represent. Signs of Life will lead you on a journey to a fuller understanding of the marks that identify you as a Christian. Signs that will advertise your faith. Personal imprints that can impact souls for eternity and help you become a person of influence who radiates relevancy, authenticity, generosity, and compassion every day ? just like Jesus did.